It's a breakneck finale that can end only in earth's salvation, or the annihilation of all that humankind has ever accomplished in space. Don't miss any of the action on the Asteroid Belt in Ben Bova's The Asteroid Wars. Book 3 of the series is just as exciting and well done as the first two books, (And maybe even better than the books that came after this one). It's easy (and unfair) to nit-pick a book after the fact, so I won't do that with some minor details that don't matter to the book as a whole.. But it did seem like there's a book missing between books 2 and 3. The saga of Poncho's sister in cold storage seems glossed over, and they don't explain the transition of her being hidden in the tunnels on the moon, to her rejuvenation and subsequent trip out to Saturn on the space habitat.. it's touched on in MANY books in this series, but never fully brought out as a plot or sub-plot, even though the basics of the sub-plot are well laid out... it just seems to be skipped over and foot noted. I didn't especially like Bova in his early years when the books first came out, but I think I have now listened to everything he's written, and I hope this series goes beyond Titan (The last book as of this writing) since I think We've all fallen in love with Poncho. 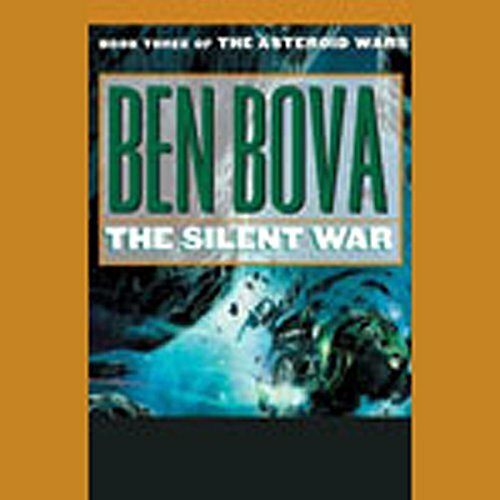 "the Silent War" is good fun, and fast paced, and (as usual) not everything is "happy and clear cut", Bova has a gift of being able to keep the characters real, they're not perfect, they have their flaws, he keeps them in the realm of reality. You are almost ashamed of yourself when the characters are admonished near the end and you see the facts laid out as a bystander would see them... you look back and see the twists and turns and "Justifications" for what was done, and realize that your favorite hero isn't as "Up right" as you thought, and maybe you aren't either since you tend to agree with a lot of what she's done along the way. It's a true Gift to be able to draw a reader into a story that deeply. I especially like Bova because he (semi)explains the science behind the fiction to make it more believable.. it seems like we could "almost" make the Fictional things in his book real. Another, and third book, in the Rock Rats series--this one covers corporate war in the asteroid zone. Corporations at war? Hmm, now that's a concept. There's good strategy in this book and just enough fighting to make it fun; too much more and it would be as exciting as reading US revolutionary war stores about battles in the counties of New Jersey (Yawn!). The book is chock full of really bad guys--our heroine tries like mad to kill them off. The crescendo at the end is followed by a bland war's end, which isn't an unrealistic one...just unexciting. On to the next Bova book. I'm still hating the play-like narration. voices of characters switching and inconsistent. Just not what I want in an audio-book.